Business is not always about profit. It is about the customers and the trust they have in you; and this depends largely on the commitment you have shown towards cementing that trust. Read on to know more about this..
Trust is core to any human relationship and relations with customers are no different. A happy customer goes a long way in securing the good image of a brand which in the long run always spells success. Good relations can be developed on transparent dealings, responsible behaviour, security and inclusiveness. Many retailers, in the quest for profits, forget that a more lasting gain can be achieved based solely on these essential values. For a business nothing can be more harmful than dishonest dealings. If a customer feels cheated or does not get value for his money, it spells doom for the retailer. The failure to deliver quality to the customer in spite of promising it is as good as cheating the customer. For example, billing details should always be clearly printed and there should be no mismatch between billed prices and actual price tags. And if you are selling marginal merchandise at too high a price, your customers will, over time, find another place to shop. Long-standing trust can be secured by telling the truth and maintaining a transparency in company functions. Accountability should be visible in whatever the company does. It is a value that should exist in the entire employee chain, right from the sales person to the store manager and ultimately the director of the store. This can only be achieved at by responsible behaviour. Scheduling quarterly reviews for employees of the company is a good way to make sure they are aware of their responsibilities. These reviews are also a way of increasing productivity, as the employee feels he /she is being tested solely on performance so performs better, in turn increasing productivity. An employee if rated well on his/her quarterly review, gains a sense of motivation, and goes out of his/her way to satisfy the customer. Customers appreciate such a thing and this goes a long way in cementing trust with the company. A customer should always have a sense of security and comfort while shopping at your store. A retailer can guarantee security in the form of perfect alarm systems, proper lighting, secure fitting rooms with proper locks and trained staff at parking lots for safekeeping of vehicles. Trust is built on a feeling of security and customers will want to shop at a certain store again only if they feel secure. What holds a family together is the feeling of ‘belongingness’; the same is valid for running a business, where, inclusiveness of the employees, the head and the customers inside one loop keeps the machinery running well. All should be encouraged to have a sense of ownership towards the business. A retailer can do a lot to initiate trust using the concept of ‘inclusiveness’. Weekly newsletters to customers on special offers, special discounts for regular customers, bonuses for senior citizens, play-area for toddlers are a few activities that come within the sphere of inclusiveness. 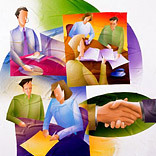 The bed rock of a customer-business relationship is trust. Having a clear way of business based on truthfulness is a sure-shot way to a customer’s heart. To ensure that the customer is a ‘wanted’ entity is also essential. Loyalty programs, company club memberships and a host of other customer-centric bonuses are some ways employed by retailers to woo customers. Well-stocked inventory, exciting discounts and sale, secure parking facility (preferably free of cost) which is well-lit and spacious attracts customers to have faith in your brand.